The Spinal Accessory Nerve (SAN) or Cranial Nerve 11 is termed a cranial nerve as it was originally believed to originate in the brain. It has both a cranial and a spinal part, though debate still rages regarding if the cranial part is really a part of the SAN or part of the vagus nerve. The cranial part , along with the cranial nerves 9 and 10, supplies innervation to the soft palate, larynx and pharynx. The spinal part supplies innervation to the Sternocleidomastoid and Trapezius muscles. The spinal part on the SAN arises from C1- C5/6 nerve roots. The smaller cranial part originates from the lateral aspect of the medulla oblongata. Cranial Portion: travels from medulla up to jugular foramen to exit and join the vagus nerve on its way to supply the soft palate, larynx and pharynx. Spinal Portion: Travels upwards as the C1-C5/6 spinal root section join together and exit out the jugular foramen, with the cranial portion. 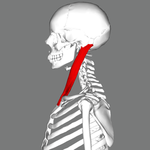 It goes on to supply the Sternocleidomastoid and Trapezius muscles. As the Trapezius and sternocleidomastoid muscles are derived from the pharyngeal arches some believe they must carry special visceral efferent information and other argue that they must contain general somatic efferent information. Injury to the SAN causes varying degrees of disfunction to the Trapezius muscle and the Sternocleidomastoid muscle. surgical procedures such as lymph node biopsy, parotid surgery, carotid surgery and jugular vein cannulation. The following conditions may affect nerve function eg Pharyngo-cervical-brachial variant of Guillain-Barre-syndrome, Sandifer syndrome, Eagle-syndrome, Diphtheria (infection), Poliomyelitis or Tetanus (both situations that rarely can affect the XI nerve), botulism, and sarcoidosis. Other causes are diabetes, vitamin B12 deficiency, and tumours. A thorough medical and objective history should be carried out to determine the reasons for damage and the extent of the damage. Surgical options comprise nerve surgery, nerve grafting, and nerve regeneration. Other treatment options include tendon or muscle transfer to stabilise scapula, employed for patients not responding to nerve repair or surgery. One of the widely used surgical procedures is scapulothoracic fusion.